I’m doing final preps for the Denver Noise Fest for the Carbon Dioxide Ensemble set tonight (Dec 22nd, 2016) at Globe Hall. This work includes testing my signal flows and getting the mixer set. There will be lots of acts so a fast setup time is important. I’ve really been enjoying the Mackie 802VLZ4 for shows like this one so in this post I’ll pass along some notes on this versatile workhorse mixer. I see tons of 402VLZ4’s at shows so let’s first look at the what the 802 has that makes it worth lugging a bigger mixer. 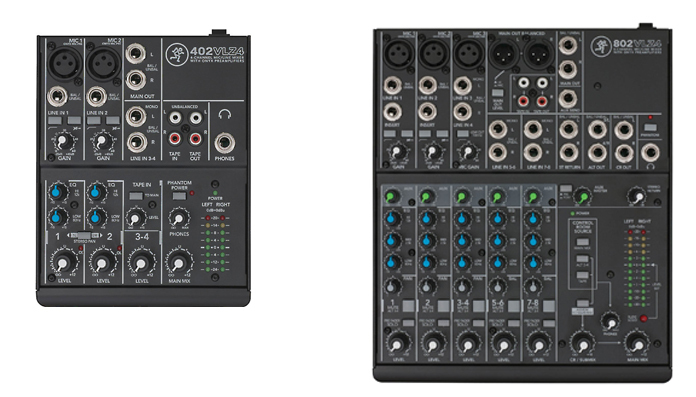 And don’t get me wrong, at $99 the 402VLZ4 is a great little mixer. The 802 has a few features though that make it well worth the $199 street price tag if you do anything other than basic sub-mixing to the house. In addition to the extra inputs, the 802 has some super handy features. 2 x XLR Main Outs. Yes in addition to the 1/4″ outs, there are XLR outs for the mains. I can’t even tell you how many times I’ve been setting up for a live performance and the house runs out of DI’s. Having XLR out saves the day and you can plug right into the snake. Panning on every channel. Super handy for taking a mono signal and getting into stereo on channels 1 & 2. A more robust control room source mix matrix. Essential for our ensemble. And most important of all the mighty Alt 3-4 stereo bus. Note the 802 is small enough to fit in a Pelican 1510. Any channel on the board can be routed to the 3-4 bus which has it’s own balanced ALT OUT. In the case of the Carbon Dioxide Ensemble, I take input from a copper heart being articulated with dry ice as a mono signal into channel 1. I can adjust the gain and EQ it, then press the 3/4 button to route it to the ALT OUT which I send to the Octatrack in as a stereo pair allowing me to both resample it, plus route the channel to the master out. In the Control Room Source section – press the “Alt 3-4” button and “ASSIGN TO MAIN MIX” button which routes this signal to both buses. Turning up CR/SUBMIX increases gain for both outputs. I route CR OUT to the Octatrack in. 3M plastic tape (which you can grab from Target) is great for mixer annotation in that it leaves not residue on the board. Sharpie up your notes in prep – not the night of the show. This will help you setup quickly plus reduce stress during a show. Click on the pics to see closeups. As I said, setup will be fast paced, so I’ve setup channels 7/8 as inputs Victoria’s rig in case the house runs out of channels on the snake. The entire ensemble can submix through my board to the house in stereo – bam. I always set this sort of thing up and test it with inputs from my phone. This helps me get muscle memory for the mixer before the show and test my assumptions about how the routing will work out. Simply put – I use the hell out of this mixer. I use it for live shows, for the Rocky Mountain Synthesizer meetup, improv sessions. It’s the least expensive mixer in the line with XLR outs and the 3-4 bus. Highly recommended if you can stretch a little further dollar-wise.